Citric Acid, Natural & Artificial Flavor, Malic Acid, Sucralose, Fruit & Vegetable Juice (Color), Silicon Dioxide, Calcium Silicate, Tartaric Acid, Acesulfame Potassium. 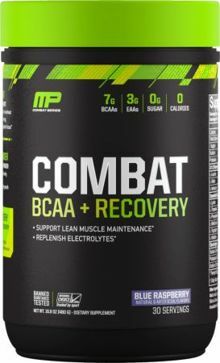 Mix one serving (1 scoop) of Combat BCAA + Recovery in 8-12 fl. oz. of cold water and take before, during or after training. Use as part of a healthy diet and exercise program. For healthy adults 18 years of age or older only. Consult your physician befor using this product if you are taking any prescription or over the counter medications or supplements. Do not use this product if you are pregnant or are nursing. Do not use this product if you are at risk or are being treated for any medical condition or if you are taking a MAO inhibitor. KEEP OUT OF REACH OF CHILDREN. Store at room temperature. Exposure to heat, light or air can affect flavor or aroma. Therefore keep out of direct light or heat. Keep sealed when not in use. Light to moderate clumping may occur. Citric Acid, Malic Acid, Natural and Artificial Flavor, Sucralose, Fruit & Vegetable Juice (Color), Silicon Dioxide, Calcium Silicate, Tartaric Acid, Acesulfame Potassium.